Lonesome Traveler is Kerouac’s “other” travel memoir – the one that isn’t On the Road. I was only dimly aware of its existence until I saw it sticking out rather prominently, on sale, in a second-hand bookshop in Canterbury. Kerouac’s writing has always intrigued me; and I have long been fascinated by the entire “Beatnik” generation of the 50s and 60s, with their connections to the civil rights movement, to the (so-called) sexual revolution, and ultimately to 1969. Lonesome Traveler address these themes, albeit incidentally; more than anything else, though, it is an astonishingly wide-ranging travelogue, from a high mountaintop in the Great Northwest to a railroad track, from Tangiers to Provence. Kerouac is a wanderer with no destination – but not, indeed, the equivalent of a Parisian flaneur, languidly observing the cityscape before him, always a spectator, slightly detached, mildly contemptuous and never entirely involved with the drama that is being played out before him – no, Kerouac’s wandering takes place at a fervid, feverish, burning pace, and everywhere he goes, he is immersed – lost, even – in the world in which he has arrived. It is striking. It needs intense concentration to follow the thread of thought as it spins its way into all kinds of random contortions. And it takes some getting used to. But I think it works. It works in the same way that the fragmented style of first-wave modernist poetry worked. Think of Eliot’s The Love Song of J. Alfred Prufrock. The point of the broken, scattered verse is precisely to capture the broken, scattered nature of Prufrock’s thoughts, his hundred indecisions, visions and revisions, his hesitation, his “I dare not” waiting upon his “I would” – and through that, both to rebel against the romanticist conception of the unity of the soul, as well as to capture something of the essence of life in the rapidly-changing twentieth century, with its sense of displacement, drift and uncertainty. To my mind, Eliot succeeds so spectacularly not only because his fragmented form fits his chosen themes, but because after you’ve read Prufrock, you realise that the form is the only vehicle with which to express that particular set of thoughts. Prufrock would fail utterly if it was written in alexandrines, or consisted of couplets in iambic pentameter, or in the form of a villanelle, or a traditional sonnet (in fact, while the first two stanzas follow something like a sonnet format, they depart so much from it that the model is perhaps simply to establish that it is a love poem, although of a very different kind) – because all those forms suggest a structure and symmetry that is entirely alien to Prufrock. Something similar, I feel, is at play with Lonesome Traveler. Sentence structure and punctuation imposes a kind of order that would be at odds with the life that Kerouac is describing. It would be at odds with the crazy life on the railroad, the smoking of opium joints in a village on a hitch-hike through Mexico, the fourth-class voyage on the packet from Tangiers to France, or for that matter, with the drug-and-poetry infused nightlife of the beatniks in New York. Of course, that is not to say that you can write any old thing – just think of some (but by no means all) of the poems of Ezra Pound, or Auden’s imitations of Eliot, where the broken verse simply dissolves into senselessness – and you realise that merely working with fragmented form is no guarantee of form – it must also make sense! And Kerouac, well, I don’t think he always makes sense – but he often does, and when he does – like in the two paragraphs I quoted – the effect is very Prufrock-esque – the form and the theme and the content all mesh together perfectly, so that any other way of expression becomes unthinkable. Another – slightly different way – of looking at it. 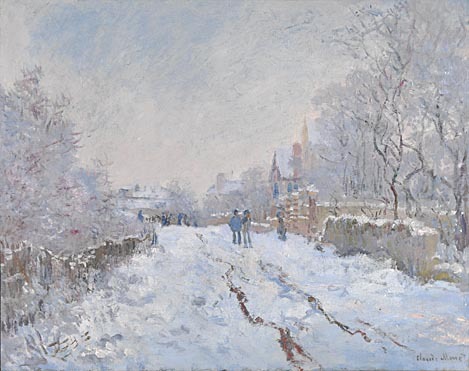 Here is a Monet painting of a snowbound landscape. 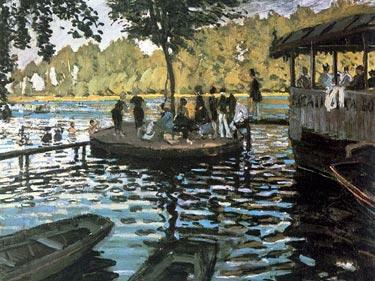 Now one of the points about the impressionist movement – as I understand it – with their hurried brush-strokes and use of lines – was to depict things as they appear to us, not just visually, but to all the senses and the mind as well. The affect that the shimmering of water has, for instance (see another Monet) – or, in the example above, the haze of the snow. So, what may be otherwise perceived as a lack of finish, or a coarseness, is actually a tool to portray reality as we feel and sense it, and not just as it might look. And similarly, Kerouac’s prose depicts life as it is lived, not merely described. In his article in The London Review of Books, Eliot and the Shudder, Frank Kermode presents a fascinating account of T.S. Eliot’s aesthetics. Eliot, he says, valued a particular sensation that, in an analysis of Tennyson’s In Memoriam, he labeled “the shudder”. This shudder, according to Kermode, is about “describing the horror, or even the beauty, of a body’s response to violent stimulus. Eliot admired shock and surprise, looked for these qualities in his own verse, and judged others, as he does Tennyson, by their success in providing them.” More specifically, by the shudder Eliot (according to Kermode) refers to “experiences one would rather not have, and which are roughly antithetical to moments of ecstasy.” It “belongs to a set that includes ‘fear’ and ‘horror’ and is associated with a powerful physical response.” For Kermode, Yeats’ Leda and the Swan is an example par excellence of a shudder-inducing poem. Kermode himself, in his article, uses different words to describe the phenomenon. The French word “frisson“; a “hit”; “shock”; “a touch of mystery”; Poe’s “quality of surprise”; and so on. For my part, all of these, I think, are partly true, yet incomplete. The “shudder” (and there probably is no better word for the experience in question), I would suggest, is the product of an intense – almost paradoxical – meeting of novelty and recognition. When Eliot talks about words in new combinations, I take him to mean that the words themselves are familiar, and used in a familiar context, but it is the way that they associate with each other that is novel (Eliot’s classic example, Shakespeare’s phrase “strong toil of grace” to describe Cleopatera’s seductive beauty, is an outstanding illustration – “strong toil” and “grace“). Now, the initial force of the phrase certainly, I think, stems from its novelty; but the Eliotic shudder isn’t simply novelty. After the initial shock, the hit, we recognise the new combination as expressing something important about the human condition in a way that hasn’t been expressed before, but that is nonetheless, in a sense, true. That is the stage of recognition, of matching the novel description, the novel association of ideas, thoughts, sensations, feelings (and I know that these are all different things for Eliot) with our prior experiences and beliefs, and it is at the moment when the two align that the “shudder” is completed. In a sense, the “novel” association has always been latent within us, as a way of understanding ourselves and the world, and the great poets tease it out into awareness. But what is crucial is that we do realise that it was, indeed, latent, and what the novelty does is to prompt an awakening. To illustrate these admittedly vague generalisations, I will refer – yet again, in this blog – to the poetry of Charles Baudelaire. Previously, I’ve found Baudelaire fascinating because of his approach to the impossibility of achieving the ideal, and his ideas about the ugliness of beauty. But I feel that above all else, his poetry evokes – most brilliantly – the Eliotic “shudder”. I’ve already written about A Une Passante, Le Soleil, L’Ideal, Le Cygne, Hymn to Beauty and The Carcass, all of whom I think exhibit this quality in abundance. But here are three more examples (Aggeler translations). I will attempt no analysis of them, only say that I felt – never more strongly – the Eliotic shudder when I read them. Perhaps you will, too. Only the memories of suns. That will serve me as a tomb. It is because our souls have not enough boldness.